You’re probably dying for an update on how things went with the draining of the swimming pool! Long story short- bear is still swimming away happily and Rachel can breathe a little easier after the reduction – and she did not go in to labour! phew! <3 I was so so so glad to be up in Brisbane with Rach. We both needed each other. Only 25 sleeps until we’re in Brisbane for an extended stay. I cannnnn notttttt wait! We read that there’s a chance that amnioreduction can lead to preterm labour, so I decided to start my breast pumping regime a few weeks early. Usually you start 6 weeks beforehand, but you can start anywhere up to 10 weeks. So this morning I started breast pumping. I’ve been following the Newman Goldfarb protocol since our positive pregnancy test, and now it’s “go time” to properly induce lactation. This means using a hospital grade double electric breast pump every 3 hours (including overnight!) for the rest of my breastfeeding journey (until of course bubs comes along, by which stage hopefully my supply will be large enough to meet their needs, and then I will only pump when necessary to fill in gaps as they arise). So far it’s pretty fun, but oh my god it’s such a weird sensation! Kinda uncomfortable but not painful. And now for the part that happened a few weeks ago! We had an amazing weekend, with all of the team together! It’s the first time that the whole team has been together in Adelaide, and I’ve got to say that I cherished every minute of it. It felt like a family holiday mixed in with Christmas and New Year’s all at once. It was like having friends over who you hadn’t seen in years, rolled together with friends you have over every weekend and feel you’ve known forever. We’ve had Rach down by herself a handful of times now, but to be able to have everyone living under the same roof at home here for the weekend just felt so perfect. Rachel has 3 girls, 1 husband, 2 cats, 1 wifey *points at self*. I remember when I first started familiarising myself with surrogacy, and I quickly learned that I wasn’t just looking for a surrogate – I was looking for a surrogate and her family. I love Rachel’s family beyond measure. Not only are they amazing support to her, but they are so supportive of David and I, we really can’t begin to describe just how lovely it was to welcome them all to our home. I love each of her girls for different reasons – they are such beautiful little ladies inside and out, and are pure joy to be around, which isn’t all that surprising considering who they call mum and dad. We also had the opportunity to get to know Rach’s husband more on this trip, which was utterly delightful (and it helps that he’s just as obsessed with Pokemon GO at the moment as I am). I only wish that his Pokemon habits would rub off on David – wishful thinking! Rach’s hubby is the glue that holds our surrogacy operation together, he’s fiercely supportive of Rachel, which in turn is a huge reason why we’ve been able to do what we’re doing. Quite simply, his support of his wife is one of the reasons why I’m going to be a mum, which is pretty huge when you think about it. 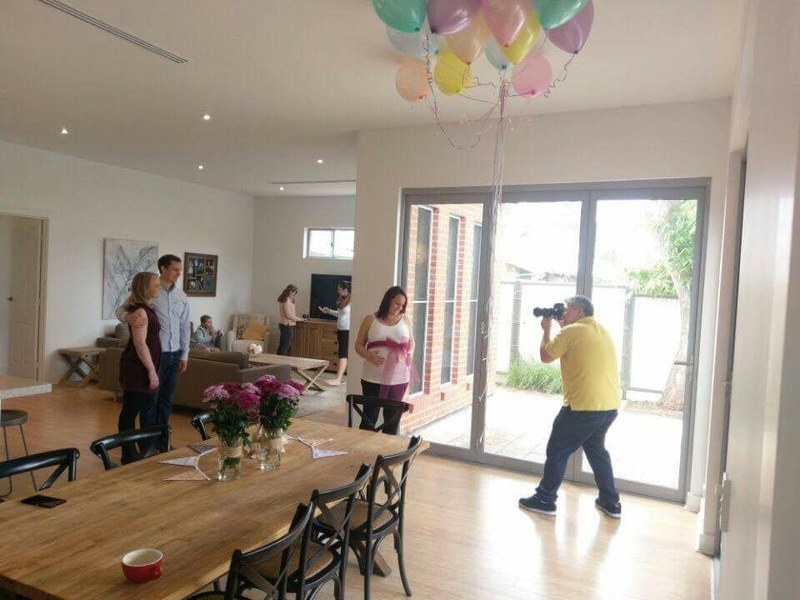 The day after they arrived, we had a photographer come over to take some photos of us all to keep as a memory of our surrogacy adventure together. The photographer was under strict instruction to not take any creepy pregnancy photos. At one stage he said “do you guys want to put your hands on Rachel’s belly?” And we were like NO TOO CREEPY, and then proceeded to take an even creepier pic with Rachel in between our husbands. The caption for that one has definitely gotta be “aw yeah, we’ve both knocked her up”. Not awkward at all. Here’s a few preview shots of our session! From the few photo previews we’ve seen, I think they’re going to turn out to be amazing. 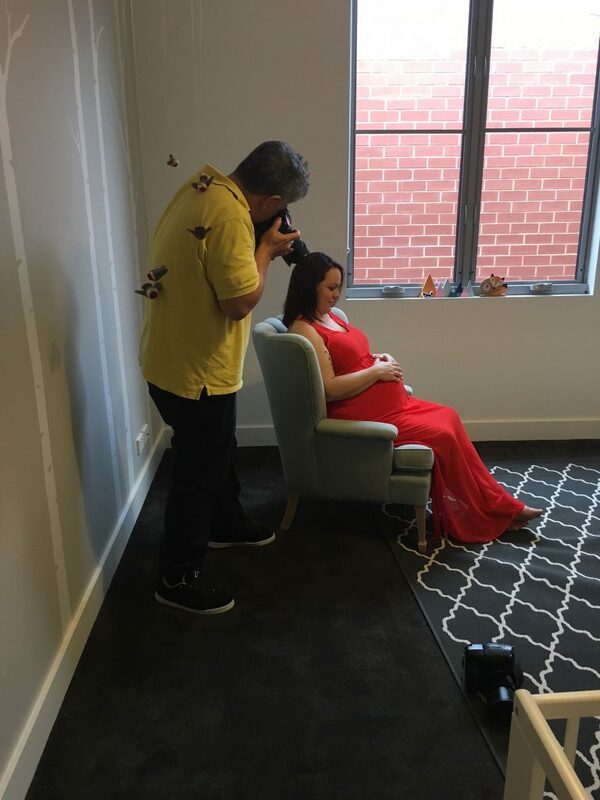 I’ve been really keen on a surrogacy shoot from the get-go, not only to have record of this moment in time for ourselves, but to have record of this time that has brought our families together. I am feeling very impatient and want the photos back as soon as possible, but our photographer is under the pump at the moment. As soon as we get them back we’ll share them with you all! The day after our photoshoot, we were blessed to be surrounded by a small group of friends and family for a celebratory morning tea. I may have teared up a little… ok, a lot! My aunty did way too much baking (leftovers for days!! ), and mum made her famous sausage rolls. We took the girlies ice skating that afternoon, ate way too much, and wandered around Glenelg foreshore catching Pokemon. The highlight of the day for me happened when we were sitting at dinner, and Rachel motioned for me to come over and cop a feel of her belly. It was then that I felt the tiniest little muffled “thud” against my palm. Bear was saying hello!!! I squealed with delight, and looked up to see Rach’s husband smiling at me – it’s the most I’d seen him smile all weekend, which really brought home how supportive he has been to all of us. A full on weekend, full of love, light and laughter! So not far away now! I just love these updates, so glad bear is going so well! What a beautiful red dress Rachel! I love the idea of a photoshoot! !